Like other first grade teachers, Vicki keeps this format all year. 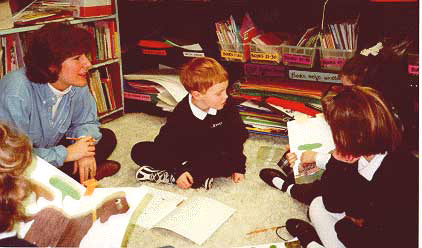 Students at this age are simultaneously learning to read and write and learning how to interact with others and books. For these reasons, teachers of early primary grade students generally need to provide more overt teacher direction for literature circles than do some teachers of older students. 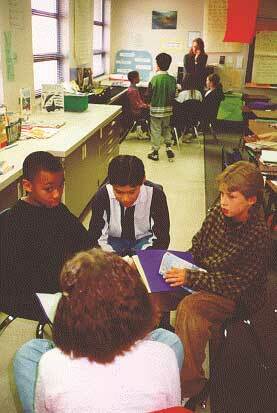 First grade teacher Vicki Yousoofian and her students at St. Joseph's School in Seattle, Washington. When Janine King first started literature circles, one group met at a time and she sat near them and took anecdotal notes on their discussions. 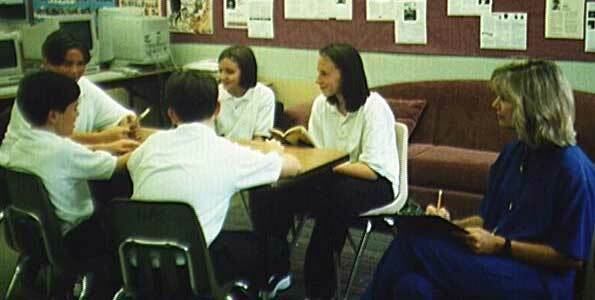 As shown in Figure 3.7, Janine sat close enough to hear her sixth graders' conversation, but far enough away so that the students did not rely on her to run the group. She kept this format all year, even though her students became independent enough for several groups to meet at once. She felt strongly that this format allowed her to observe how the groups worked together, as well as gave her a wealth of insight into students' responses to the books. "I would miss out on so much rich discussion if I wasn't there," she said. In Lori Scobie's fourth grade classroom, all groups meet at the same time for their discussions (Figure 3.8) because this is what seems most manageable to her. She can plan a set time each week when she knows that all groups will discuss.